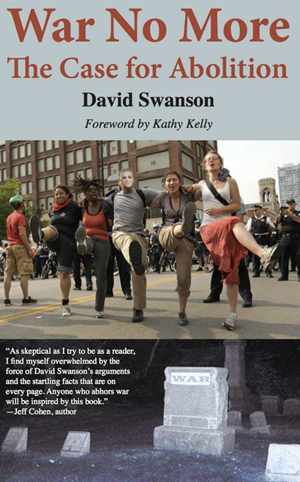 Book Review: War No More: The Case for Abolition, by David Swanson (2013). Each generation has to come to its own understanding about war and the tragic loss of life which accompanies it. Today this book ardently addresses wars in Iraq, Afghanistan, Libya, Syria and elsewhere in the headlines. Previously, the Great War (World War I) left 21 million men wounded and more than 8.5 million soldiers dead on all fronts, together with at least 12 million civilian deaths. Conscientious objectors to this madness were brutalized and imprisoned in Britain and the United States. Fast forwarding to the Vietnam War, now a generation ago, it was the last war in America with a forced draft. Then the road to a conscientious objection to Vietnam was somewhat less hazardous with many being able to flee to the safe haven of Canada. But Muhammad Ali did not flee and he was ordered imprisoned for his objection to Vietnam until the Supreme Court freed him. Be it Eugene Debs campaigning to eliminate war from his prison cell almost 100 years ago, Muhammad Ali, or David Swanson today with his many Peace efforts, they all had to educate themselves at some point on the moral, philosophical, religious, humanitarian and practical facts supporting an emerging conscience which was telling them that war must stop and that there must be alternatives to it. Because there is no military draft at present, few citizens have to face the direct issues surrounding war since they are not forced to kill by being made into a soldier. But when conscience does call and the moral perplexity which is war surfaces, David Swanson in this short book provides an education and many talking points on the question. To those who might contend that wars are dying out and that mankind is becoming less violent, Mr. Swanson carefully argues that this misplaced claim ignores the following factors. As another unnecessary cause of war, he also argues that the United States government “has been misidentifying new Hitlers for three-quarters of a century.” (44) Here the author believes and contends that much has changed since the end of World War II and a new Hitler is not even possible today. Here this reviewer suggests that Mr. Swanson omits the beginning of the Cold War at the end of World War II and the Soviet terror which was Joseph Stalin, surely another Hitler. This danger resulted in the containment policy of President Harry Truman which prevented Greece from falling to the Soviets and which lead to the Marshall Plan which restored Western Europe economically and politically. And what about the morality or necessity of military force once South Korea was invaded by the North at the behest of Stalin? It was believed that further appeasement in Korea would lead to World War III since appeasement of Hitler was thought to have been a cause of World War II. But this writer’s sole references to Korea are first to call it a Pentagon offensive war and second to claim that it “accomplish[ed] exactly nothing.” (159) However, this “offensive war” claim is historically inaccurate since the North invaded the South in a drive to the Sea until the United Nations defensively intervened. The success of South Korea today, which still lives in economic and political freedom while the North starves, also belies the nothing accomplished assertion. And, some 60 years later, North Korea still remains a nuclear armed menace. These are issues which cannot be ignored when arguing that war should never again be an instrument of state policy. On the other hand, the author effectively makes the point that many wars can be avoided through sincere negotiations, and credits President Dwight Eisenhower for avoiding war over the U-2 incident when that spy plane was shot down over Soviet airspace. We all can remember that Eisenhower is a good example of how a strong President without macho or inferiority issues can stand up to the military-industrial complex which sought several wars during his Presidency, which he avoided, including an atomic war with Communist China. Mr. Swanson’s version of a misplaced United States participation in World War II against Nazism and Japanese Imperialism, or his claim that the Soviets “primarily defeated” Hitler, with others “playing relatively minor parts” (109), or that the use of the atomic bomb on Japan “was in no way justified” (114), also can be critiqued. For example, American casualties in the world war up to the anticipated invasion of Japan already exceeded one million. One expectation was that another million soldiers, sailors and airmen would die or be maimed in an invasion. Most of the cities of Japan had already been firebombed and destroyed, including Tokyo, at great loss of life in the hundreds of thousands, but still the Japanese refused to surrender. Kamikaze pilots, like present day suicide bombers, were suicidally crashing their planes into American naval ships at a great loss of vessels and men. Japan also had prepared its citizens for hand to hand combat to the death by women, children and the elderly in defense of their homeland. In light of such facts, President Harry Truman’s decision to use the atomic bomb to hopefully force the Japanese Emperor to intervene and surrender is certainly a defensible one and is not as clearly wrong as the author suggests. But the important point made here in this book is that in the opinion of the author these historical circumstances will not repeat themselves and total war can be eliminated; for the world has changed too much in the succeeding years. For example, nonviolent resistance is now a widely known tactic to resist a military invasion. This argument is a defensible one. 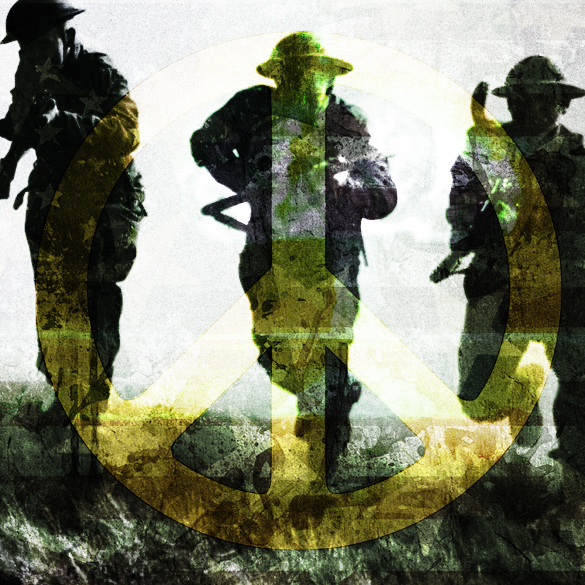 All in all, War No More is a valuable contribution to the body of anti-war literature. Since he holds a master’s degree in philosophy, perhaps Swanson finds himself in the tradition of Bertrand Russell, the renowned philosopher, mathematician, British Earl and eventual prisoner of conscience, who eloquently argued in the Great War era that war serves no great human purpose for either side. David Swanson agrees for all the reasons well stated in this work.